The United States Department of Agriculture has released a number of files about alleged alien and UFO activity on land managed by the US Forest Service, including details of the outlandish allegation. The US Forest Service data was obtained by John Greenewald, founder of The Black Vault website, who obtains and publishes former confidential official data on aliens and UFOs. Records of the service’s Southwestern Region office in Albuquerque, New Mexico, detail a bizarre call from an alleged witness to the construction of an alien base in the Tonto National Forest, near Phoenix, Arizona. An email was sent by the department to all rangers on December 30 2013, detailing the extraordinary encounter. “He found a severed head and claims to have pictures of some of this stuff. “Caller reported that he is 60, not crazy and doesn’t do drugs. There are longstanding claims by alien conspiracy theorists that there are aliens living here on earth, and the government knows all about it, but it is kept top secret from the public for fear of what would happen if they knew. George A Filer is a former US Airforce Intelligence Officer, who claims aliens in UFOs were actually aiding the US during the Vietnam War. He is now the director of the eastern section of the Mutual UFO Network (MUFON), based in the US, which is the world’s largest organisation dedicated to UFO and alien investigation. Caller claims to have seen construction cranes coming out the side of the cliffs, miniature stealth planes and UFOs, aliens and people working together at the site, aliens eating people. “I discovered this while camping in the Sierra Ancha Wilderness. “The UFOs kept flying down into the basin two minutes apart. They flew low, out of the southeast at about two thousand feet above the terrain. “During the daytime A-10’s use the area for training. Re-fueling practice also occurs here both day and night. “These areas have also been plagued with several unexplained disappearances that have occurred in Cochise County over the last 30 years. “Cars are abandoned with people’s ID; money and keys left behind. 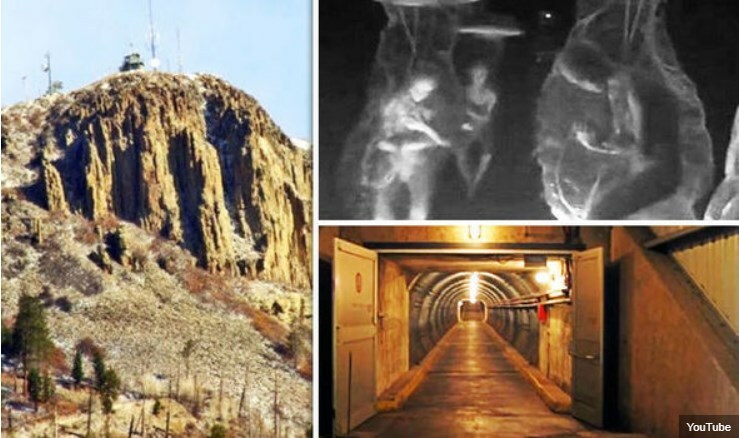 Alleged bases include a huge underground one beneath Dulce, New Mexico, about 250 miles from the Tonto National Forest, a base for a species of aliens known as “Tall Whites” within the Nellis Airforce base in Nevada, and also an alien/military base at the top secret Area 51 US Airforce site also in Nevada. Scott C Waring is a firm believer in the conspiracy theories, and said on his ufosightingsdaily.com blog: “Just on the outskirts of Las Vegas is Nellis Air Force Base, which has a Tall Whites Base near the old firing range area. “It’s a huge base taking up 1,350 square miles! Enough for a small country. “So why would the Air Force need such a large area of land? Because they gave some of it to aliens to build underground bases, but sometimes the are outside going for a walk, so the USAF gives them their own space so they don’t accidentally encounter a person and kill them.